Preservation of living things to be revived at a later date. A "cryo-tube" is a piece of technology utilised by Applied Cryogenics for their services and has been in use, apparently unchanged, for over a thousand years. Invented sometime before the end of 1999, these freezers put the subject into a kind of suspended animation unlike that used by 20th century cryonicists, which freezes the occupant, whether human, robot or dripping alcohol perfectly in place within seconds and allows them to resume where they left off seconds or millennia later. Settings for millions of years also exist, but it is unknown whether the device has an upper limit to the time an occupant can be frozen safely. These chambers are self powered, which could suggest they were installed at Applied Cryogenics after 1997's power failure. Alternate names, in decreasing order of likelihood, include "cryotube", "cryonic freezing chamber", "freezer-tube", "Hawking chamber", "freezer-doodle" and "cryo-thingie". The tubes seem to have undergone a refurbishment in 3011, as seen in "Law and Oracle". 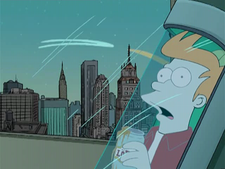 It's possible that the Planet Express crew took one of the old ones for the photo shoot in "Neutopia", as Fry poses in an older model of one. This page was last edited on 15 August 2013, at 09:46.